Light up you outdoor school, indoor working area, flood light your car park, paddocks or yard! The Arena Lights are incredibly easy and cost effective to install. All you need is a pole (many customers are using a scaffolding pole, set in quick dry cement - but anything will do). There is no need for electricians, trenches, or wiring. 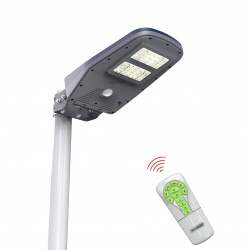 The lighting and solar panel are all in one unit and are very simple fit on top of any pole. Not only is it easy and inexpensive to install, but there is no running cost. And the effect of the lighting is first class. Our customers are always looking for the latest innovation - and this is it! Either buy as single units and build your collection, or take advantage of the 6 pack. This specifically designed Arena light is so neat, the solar panel sits on the top of the light unit and is integral. No separate solar panel needed, literally just fix to a pole! The Solar Mate Arena Light is the 2016 BETA Innovation Winner. It is an all in one solar floodlighting solution that can deliver an impressive 1000 lumens for up to six hours per 24 hours, with a 2 year warranty. 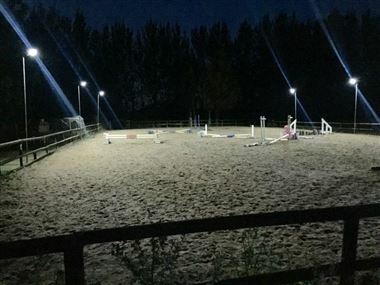 The Arena Light uses an integrated solar cell to charge an internal lithium battery, this neat and compact lighting system enables high levels of illumination to be provided where no mains power exists. Arena Light can be wall mounted or clamped onto a standard scaffold pole and has two modes of operation, both of which are activated by a supplied remote control. Passive illumination set at 50 lumen until movement is detected, when the light level increases to 500 lumen for 30 seconds or until the movement stops, and then reverts to 50 lumen. In this mode, ArenaLight can operate for either 1 or 2 hours. A further 1 or 2 hours can be activated if needed. Brightness can be changed from 500 lumen to 1000 lumen if needed. The fully weather resistant Arena Light houses an efficient crystalline solar cell which is linked to a 12000mAh lithium battery pack. Light is provided by thirty surface mounted powerful LEDs. With a forward light spread of 20m diameter (when set at a height of 4m) 40 x 20m riding menage or sports ground, for even more light coverage, just add extras as needed. If you have any questions, please don't hesitate to give us a call about this great new product. What We Say: This product was launched a few years ago and revolutionised outdoor solar lighting. It's very easy to use and reliable. There are now some competing products in the market, all using this reliable technology to extend your time outside. You may also like the Solar Sportz Light.